You were told, just like I was, that the only remedy for cavities is to fill them with amalgam, or if you went to an up-and-coming dentist, maybe you were given the option to fill them with composite. But fill them you must, because we all know the human body is not capable of healing dental cavities as it does other body parts like broken bones. Right? Basic stuff that everybody knows, isn’t it? 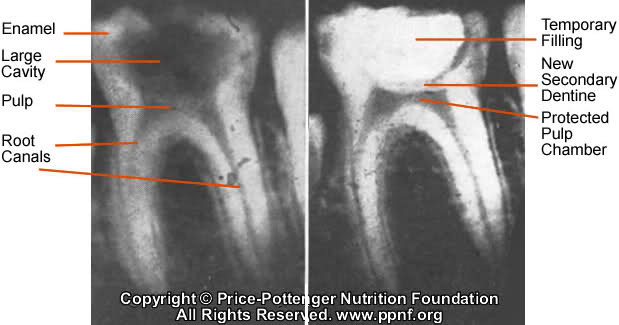 A researcher in the 1930s, who was also a dentist, suspected that tooth decay and even crowded, crooked teeth had more to do with a lack of nutrients in the modern diet, than the frequency of tooth brushing and flossing. So the determined Weston A. Price set out on a 10 year study of primitive people groups all around the world that were still eating traditional, primitive foods as the mainstay of their diets. Wherever he found isolated people groups eating their traditional diets, the people had uncrowded teeth that were almost entirely free of decay. But wherever these same tribes had adopted the western diet, they suffered horribly from disease, crowded and crooked teeth, and much tooth decay. The native people Dr. Price studied had been eating their traditional foods their entire lives, and so had their parents and so on down the line. But what if school children who already had tooth decay were to start eating some really nutrient dense foods? Would it be possible to stop their tooth decay? Could the teeth remineralize? Once he returned to his home in Ohio, Dr. Price started a lunch program for children who already had pretty bad tooth decay. And no wonder. These kids were eating highly sweetened coffee, pancakes made with white flour and covered with processed syrup, doughnuts, vegetable oils, and white bread. And for the record, the children continued to eat this way at home. 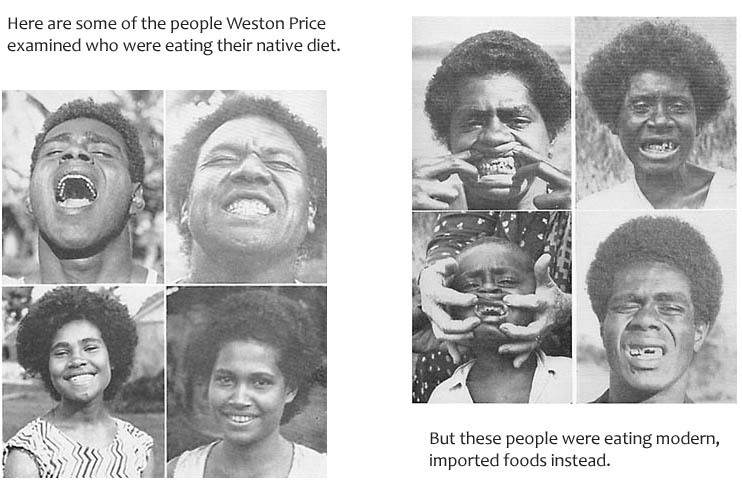 Meanwhile, for one meal of the day, six days a week, Weston Price provided these kids a nutrient dense lunch based on the foods he had observed native people eating in other parts of the world. They got a rich vegetable and meat stew made with bone broth, raw whole milk, and rolls made with freshly ground wheat and spread with deep yellow butter. For dessert, they were given cooked fruit with very little sweetener. Although this was a major improvement from what these kids were eating at home, Dr. Price knew it would not have been enough to stop the cavities in their teeth. One important thing Weston Price discovered when he analyzed samples of the foods the native people ate was that they contained at least ten times more fat soluble activators than what is present in the average American diet. The fat soluble activators are vitamins A, D, and K2, and according to Dr. Price are needed by our bodies in order to absorb the minerals in our diet. So much so that without these activators, our bodies are unable to use minerals that give us good sound bone structures and healthy, cavity-free teeth – even if minerals are plentiful in the diet. Both cod liver oil and deep yellow butter are rich in these fat soluble activators, so Dr. Price gave each child half a teaspoon of each along with their nutrient-dense lunch. The children’s teeth were checked every 4-6 weeks for a period of about five months. 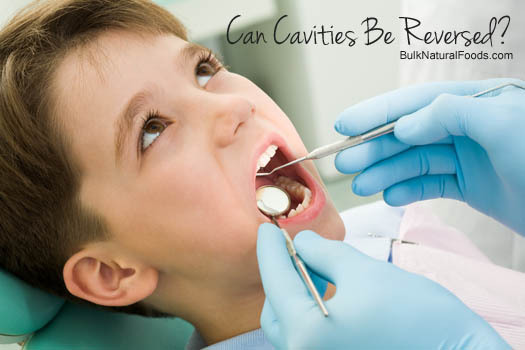 Within this amount of time, each child’s cavities were completely stopped and began to heal right underneath the temporary fillings that had been placed to stop the pain. Here is one of the before and “during” x-rays Dr. Price took of one of these children. It has been labeled by the Price-Pottenger Foundation. Tomorrow, I’ll be sharing our family’s experience with cavities, cod liver oil, and butter oil. Plus, a friend of mine will be telling her story. 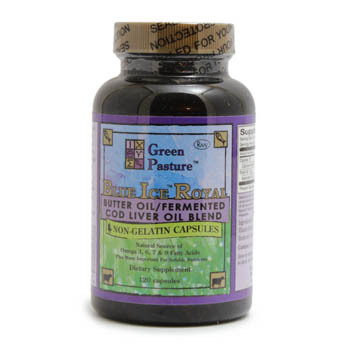 Until then, check out the cod liver oil and butter oil that’s available now on our order forms! What has your experience been? Do you use cod liver oil or butter oil regularly? Have you seen an improvement in your family’s teeth? If you liked this article, or if you think it would help out some of your friends, share it on Facebook. OrderOrder your cod liver oil and high vitamin butter oil here for local pick up. And here to have it shipped to your door. We have several flavors of liquid cod liver oil available, plus capsules of plain cod liver oil, plain butter oil, and a cod liver oil and butter oil blend. I read your information about the cod liver oils and watched the video back when you first sent that out. I was interested in giving those a try, but just put it off. However, I did order the butter oil capsules, and have been taking them along with the fish oil capsules I’ve been on for a few years. I am pleased to say that I do think they could be a contributing factor to the good dental check-ups I’ve been getting the last year. I have a history of root canals, crowns, cavities. A new calcium had reduced my dental issues significantly, and now I think the butter capsules and fish oil are improving it even more. I am wanting to see if I could get my younger kids to take the cinnamon tingle cod liver oil. Mine may not be able to swallow pills yet, so not sure if I should just give them organic butter, or the organic ghee. Did you have a particular dosage on each of the oils? $5,000 is a lot to pay for braces, which we are doing currently for one of my older ones. The next two will probably need an ortho too. BUT, maybe not. Will give this a try. I’m glad t to hear the butter oil seems to be helping. I’m leaving in just a couple minutes, so I’m going to give you a link to our cod liver oil/butter oil question & answer page. Dosages are posted there. If you’re looking to replace the butter oil with ghee, I’d suggest using the same doses for either. We cook with our ghee rather than using it as a supplement. It ends up getting eaten either way. Tropical Traditions has been out of the organic expeller pressed coconut oil for over a month now, and we’re not sure when it will be back in stock. In the mean time, we have their 5 gallon pails of a very similar oil. It’s not certified organic, but according to them, it comes from the same trees and is processed the same way. Only difference is that it has not gone through the certification process. But we only have it available in 5 gallon pails – not the 1 gallon.